From left are Jan Dobrowolski, Sue Ramsey, Gloria Romaine and social team leader Barbara Touchette. 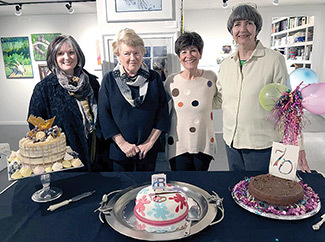 The RAL Art Center launched its 70th anniversary year January 22 at an annual members meeting. Members elected a board of directors for 2019 and celebrated the anniversary, reported vice president Barbara Kershner, communications and marketing team leader. President Harold Burnley presented the slate of board members who were unanimously elected. The board members in addition to Burnley and Kershner are secretary CarolAnne Taylor, treasurer Jeff Branflick, past president Mary Ellis, chief information officer Carol Clark, artist liaison Patty Richards, fund raising director Karen Williams, community outreach director Anne Papparella, workshop director Cheryl Mihills and legal advisor Alfie Butts. Burnley also introduced Dale Coburn, who has joined Hope Towner as a co-managing director…..